As many political observers have already noted, the Nineteenth National Congress of the Communist Party of China is expected to be held in Beijing soon, most likely in the late fall of this year. Generally speaking, this event may lead to a major power reshuffle within the top leadership of the Communist Party of China (CCP). According to the general precedent in Chinese Mainland politics so far, the majority of the members in the Politburo Standing Committee will retire right after this meeting. Members of the delegations from various provinces, municipalities, and People’s Liberation Army (PLA) commands will elect members and alternate members of the Central Committee as well as members of the Central Commission for Discipline Inspection. The new members of these two Central Committees form the power basis for the CCP leadership in the future. The First Plenary Session of the Nineteenth National Congress of the Communist Party of China will be held immediately after the CCP Nineteenth National Congress to elect General Secretary, members of Politburo, Politburo Standing Committee, endorse the members of the party Secretariat, and finally decide the members of the Military Commission of the Central Committee. Per the political and strategic culture known as the principle of “the party commands the gun” established through the Sanwan Reorganization in 1927 and the Gutian Congress in 1929, the Communist Party of China is tightly linked with the military organizations of the People’s Liberation Army. As noted in the General Program of the Party Constitution of the Communist Party of China: “The Communist Party of China persists in its leadership over the People’s Liberation Army and other armed forces of the people, builds up the strength of the People’s Liberation Army, ensures that it accomplishes its historic missions at this new stage in the new century, and gives full play to its role in consolidating national defense, defending the motherland and participating in the socialist modernization drive”, the leadership over the People’s Liberation Army is absolutely non-negotiable to the Communist Party of China. However, the party and military are interdependent in several aspects, including personnel career management and organizational alignment. Given the recent political reforms and consequences of the administrative power reorganizations in the mainland China, there are three issues concerning the synchronization of party and military that need to be well-managed in the coming CCP Nineteenth National Congress itself or the subsequent First Plenary Session of the Nineteenth National Congress. The party post is a required element for professional career development within the People’s Liberation Army and a prerequisite for further promotion. Any PLA members assigned to key leadership billets should have matching party posts compatible with their decision-making and policy formulation authorities. 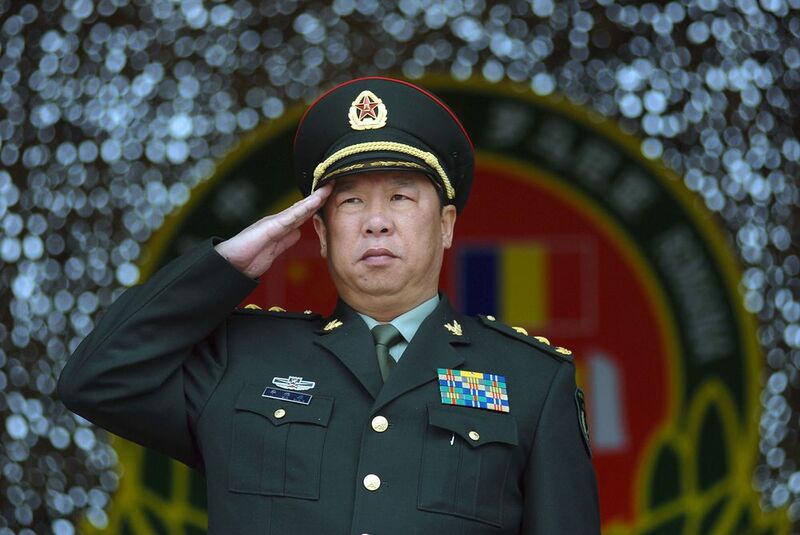 Those senior leaders with high military ranks who lose their party posts in the next five-year term National Congress of the Communist Party of China are likely to enter retirement in the near future. On the other hand, under the leadership of Xi Jinping, the prerequisite of appropriate party posts, such as members and alternate members of the Central Committee as well as members of the Central Commission for Discipline Inspection for those who want to be promoted to the rank of three-star general or admiral, may be a thing of the past. Since his inauguration as the Chairman of the Central Military Commission, Xi has personally handpicked five senior military members, two on July 31, 2015 and another three on July 28, 2017, to be promoted to the rank of the three-star general officers with no proper party post in the top tier of the Communist Party of China. Among these five senior newly promoted high rank general officers, none of them owns the party post such as members or alternate members of the Central Committee or even members of the Central Commission for Discipline Inspection. Apparently, there is a certain gap between party post and military billet developing in the top layer of the PLA leadership. There are various interpretations to explain why the mismatch of the party post and military billet may occur in such a high tier of the PLA leadership. Natural attrition together with unexpected disciplinary actions disrupted original leadership echelon arrangements is perhaps the most acceptable explanation to PLA observers. 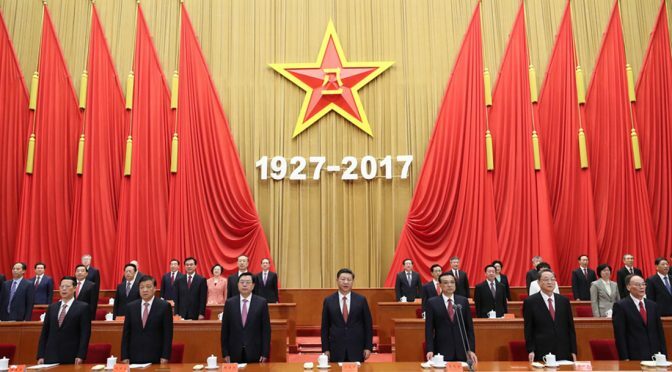 After all, a total of 24 incumbent, former, or alternate members of the Central Committee and members of the Central Commission for Discipline Inspection have been disciplined, including one former Politburo Standing Committee member and four present or former Politburo members under Xi’s leadership. Other interpretations may include that Xi is basically following the tradition to promote those senior officers with party posts unless their specialties are in areas where appropriate military billets cannot be assigned. As no suitable candidate with proper party post may be available, the selection list may naturally extend to those without a party post in the high tier of the Communist Party of China. In any case, the personnel reshuffle is unavoidable in the coming Nineteenth National Congress of the Communist Party of China in order to let the military billets match with party post. Further, certain military elites with strong professional career potential also appeared in the list of members and alternate members of the Central Committee as well as members of the Central Commission for Discipline Inspection. Most importantly, members given positions on the new list will likely have a better potential for further promotion since they are chosen by Xi and he may stay in power for at least another five years. The second issue concerning the synchronization of party and military is the possibility of re-institutionalizing of the Central Military Commission after the PLA military reform. Members of the Central Military Commission were not matched with military posts until the Fourth Plenary Session of the Sixteenth National Congress of the Communist Party of China on September 16, 2004, when Jiang Zemin resigned the chairmanship of the Central Military Commission. As Hu Jintao succeed Jiang to be the new CMC Chairman, several senior members were selected into the Central Military Commission as new members according to their military billets. Members of the Central Military are institutionalized since then by the following order: Defense Minister, Chief of the General Staff Department, Chief of the General Political Department, Chief of the General Logistics Department, Chief of the General Equipment Department, Commander, Commander of the PLA Navy, Commander of the PLA Air Force, and Commander of the Second Artillery Corps. Apart from the Chairman of the CMC, two senior military professionals will be appointed as the deputy Chairman of the CMC. An extra First Deputy Chairman of the CMC is likely to be appointed for the next generation of leadership. This similar practice was adopted for the cases both for Hu Jintao and Xi Jinping. So far, this institutionalized Central Military Commission structure was followed in the Seventeenth and Eighteenth Military Commission of the Central Committee of the Communist Party of China. Following selection of the Central of Military Commission membership, the National People’s Congress will elect another set of the members, drawing on the same pool of candidates, to the National Central Military Commission in late March after the National Congress of the Communist Party of China in the previous year. Obviously, there is a gap between the establishment dates of these two Central Military Commissions of the party and the nation separately. Nonetheless, the existing National Military Commission will somehow automatically cease to function in order to assure the synchronization of party and military. The Central Military Commission is the highest mechanism for determining the military and defense policy proposals prior to submittal to the Politburo for further discussion and review. As we already know, there have been many organizational revisions in the People Liberation Army’s administrative chain of command and operational command and control structure. It is necessary to reorganize the members of the Central Military Commission to reflect the present PLA administrative and command structure. For instance, a new service equivalent organization known as the PLA Strategic Support Force was established in January 2016. The Joint Logistics Support Force directly subordinated to the Central Military Commission is another significant reorganizational arrangement. Four General Departments are reorganized into fifteen functional departments or agencies. Most importantly, there is no representative for the newly formed PLA Ground Force, the army equivalent, as the member of the Central Military Commission so far. Due to the recent reforms noted above, the current PLA organization structure and the organization of the Central Military Commission are obviously not aligned. These reorganizations likely need to be matched with newly institutionalized Central Military Commission representation structure in order to assure their smooth operation. It is a reasonable prediction that this reorganization of the Central Military Commission will be a priority in the coming First Plenary Session of the Nineteenth National Congress of the Communist Party of China right after the CCP National Congress itself. Last but not the least, the PRC’s National Defense and Military Reform is a part of overall social reform policies as noted by a policy document known as “The Decision on Major Issues Concerning Comprehensively Deepening Reforms” (中共中央關於全面深化改革若干重大問題的決定) that was approved by the Central Committee of the Chinese Communist Party at the Third Plenary Session of the Eighteenth Chinese Communist Party Central Committee on November 12, 2013. It is naturally no surprise that numerous institutions need to be amended and experience organizational reforms in various aspects of Chinese political, legal, and social systems. This is also the case for the PLA organizational reform. For instance, the previous General Political Department of the Chinese People’s Liberation Army was consolidated into a newly established organization known as the Political Work Department of the Central Military Commission on January 11, 2016. It remains the chief political organ under the Central Military Commission and still leads all political activities in the People’s Liberation Army. Although clearly the Political Work Department of the Central Military Commission is intended to succeed the previous General Political Department of the Chinese People’s Liberation Army with all its powers, it is still necessary to revise the bureaucratic language in the Constitution of the Chinese Communist Party to fit with the new military establishment. Since, per the point four of the Article 19 of the same constitution: “The functions and powers of the National Congress of the Party are as follows: ………4) To revise the Constitution of the Party;” we should expect certain work for revising the Constitution of the Communist Party of China will be taking place in the coming Nineteenth National Congress of the Communist Party of China. 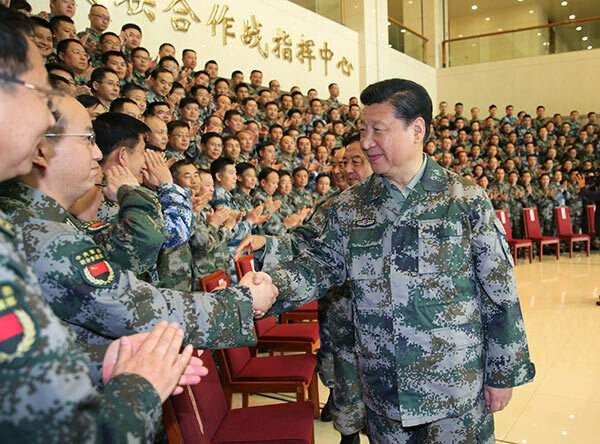 During his inspection of the PLA Hong Kong Garrison Force in this June, Xi Jinping himself called for efforts to build a highly centralized and unified military force, and run the military in accordance with law to forge a strong force with ironclad belief, faith, discipline, and responsibility. We should expect the synchronization of party post and military billet, institutionalization of the CMC after reform, and revision of the Chinese Communist Party Constitution to align with new military structures that will be a part of Xi’s legacies in the coming Nineteenth National Congress of the Communist Party of China and its subsequent First Plenary Session of the Nineteenth National Congress in October 2017. Dr. Ching Chang was a line officer in the Republic of China Navy for more than thirty years. As a very productive commentator on the Chinese military affairs, he is recognized as a leading expert on the People’s Liberation Army with unique insights on its military thinkings. Correction: The month which the Nineteenth National Congress will occur is in October, not November. Previous PostChina’s Quest for Great Power: Ships, Oil, and Foreign PolicyNext PostWill Artificial Intelligence Be Disruptive to Our Way of War? Chang Ching offers a clear-eyed analysis of the steps that the 19th Party Congress and NPC need to take to bring Party and military into congruence following Xi’s military reforms. Chang rightly concludes that harmony between the CCP and PLA will be part of Xi’s legacies in the Nov 2017 Party Congress and NPC plenary session.